For over two months now, a massive forest fire is raging on the Indonesian island of Sumatra, releasing thick, black smoke in the process that has spread to neighbouring countries. A state of emergency has been declared in six Indonesian provinces. According to news reports, the incident has disrupted transportation, schooling and business to a great extent. Hundreds of thousands of people have fallen ill. Earlier, the Singapore government had ordered the closure of schools after smoke caused the air pollution level to reach hazardous limits. A strong army of fire-fighters, including Australian experts, are trying to douse the blaze at present. However, the fire to an extent fuelled by peat deposits, is showing no sign of dying down. At present, the only hope is that monsoonal rains will finally douse it, but that will not happen till early next month. Indonesian President Joko Widodo had said earlier that the fire must be stopped within a month. He recently visited South Sumatra to assess the situation. Indonesia’s Social Minister Khofifah Indar Parawansa said the death toll from the effects of the haze had risen to 19, The Guardian reported. An estimated half a million people have suffered respiratory illnesses since the fire started around July. 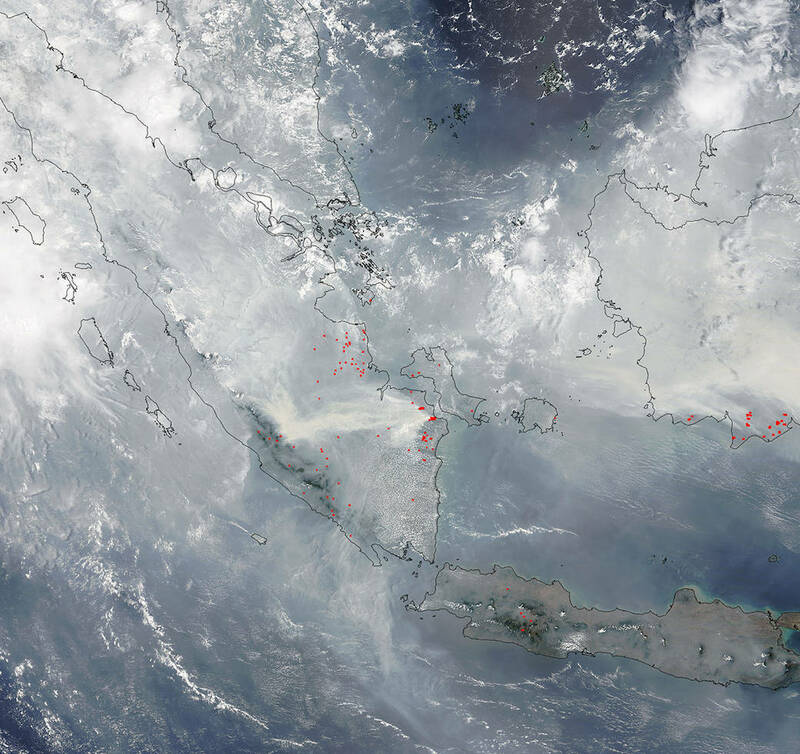 Australian news agency, news.com.au, reported that more than 40 million people have been exposed to the toxic haze, particularly those living on the main islands of Sumatra and Borneo. They have abandoned outdoor activities such as jogging and have become used to never seeing the sun through the haze, the agency wrote. According to media reports, fires in Indonesia have been a near annual occurrence since the 1980s, but this one is different. This year, the fire has been made worst by a prolonged dry season and the El Nino weather pattern. It is feared that even Australia will face the consequence of the Indonesian blaze. According to World Resources Institute, a global research non-profit, over 127,000 fires were detected across Indonesia this year. The worst part is that many of these fires were the result of clearing forested peatlands to make way for plantations, especially palm oil. Peatlands store some of the highest quantities of carbon on Earth and also emit methane, resulting in up to 200 times more damage to the global climate than regular fires. Drying of peatlands, sometimes due to burning and droughts, speeds up global warming. This happens when carbon stored in peatlands gets oxidised and turns into CO2, a super greenhouse gas. The impact of forest fires is especially significant in the run-up to the Paris climate conference at the end of this year. Deforestation usually constitutes about 60 per cent of Indonesia’s total emissions. The country has pledged to reduce deforestation and cut annual emissions by 29 per cent from business as usual by 2030, news reports say. However, this season alone, the Indonesian forest fire has released greenhouse gases equivalent to about 600 million tonnes or roughly the annual carbon emission output of Germany, according to NASA scientists, news.com.au reported. Peat fires may emit up to 10 times more methane than fires occurring on other types of land. According to a NASA press release, farmers often use fire to return nutrients to the soil and to clear the ground of unwanted plants. While fire helps enhance crops and grasses for pasture, it also produce smoke that degrades the air quality. The smoke released by any type of fire (forest, brush, crop, structure, tires, waste or wood burning) is a mixture of particles and chemicals produced by an incomplete burning of carbon-containing materials. All smoke contains carbon monoxide, carbon dioxide and particulate matter or soot. Hence, exposure to smoke should be avoided. Besides humans, orangutans are falling victim to the crisis, which has left them sick and traumatised. Rescuers at a centre for the great apes on Borneo are considering mass evacuation of the hundreds in their care.